South Africa’s Cullinan Mine could be called the greatest treasure trove the world has ever known and, 111 years after its first diamonds were found, it is still yielding major gems. 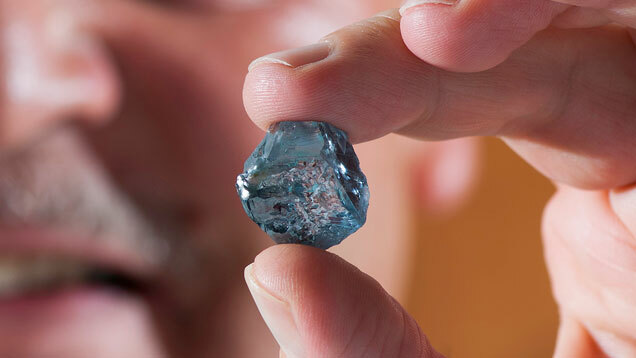 Last week, Petra Diamonds, which acquired the mine from De Beers in 2008, unveiled a 29.6 carat “exceptional” blue diamond expected to result in a “diamond of great value and importance,” according to the company. The Cullinan Mine (known as the Premier Mine until 2005) first made news in 1905 when workers found a 3,106 carat stone. Named the Cullinan Diamond after the mine’s discoverer, the gem is – to this day ‒ the largest piece of diamond rough ever found. The largest diamond cut from it was the Cullinan I, a 530 carat pear shape, probable D color, internally flawless diamond that rests atop the scepter in the crown jewels of Queen Elizabeth II. Through the years, the mine has yielded such famous diamonds as the Premier Rose (353.9 carats rough/137.02 carats polished), The Taylor-Burton (240.8 carats rough/69.42 carats polished), the Niarchos (426.5 carats rough yielded two polishes stones of 128.25 and 39.99 carats) and the Golden Jubilee (755.5 carats rough/545.67 carats polished). A number of major blue diamonds have also come from the mine: De Beers’ 27.64 carat (polished weight) Heart of Eternity and 11 other fancy blue diamonds that formed De Beers’ Millennium Collection. In all, the Cullinan Mine has produced 750 stones weighing more than 100 carats. 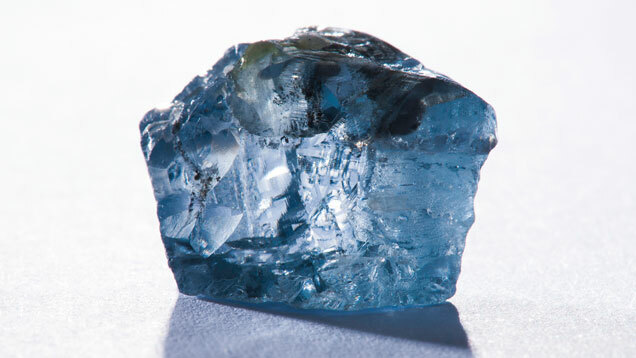 More recently, the Cullinan mine yielded a 26.6 carat blue diamond, cut into a GIA-graded Fancy Vivid blue of 7.0 carats, which sold for $9.49 million, or $1.35 million per carat. DIAMOND MARKET: After reasonably successful holiday sales of diamond jewelry in the U.S., De Beers allocated a large sight of about $750 million, with prices of medium quality goods rising 3-5%, higher in some cases. The price increases were apparently based on the assumption that demand for certain goods will increase in the spring when U.S. retailers will need to restock. As soon as the news of the price increase reached the markets, premiums on existing rough supplies also began to rise, causing concern that a new round of speculative buying – and subsequent price increases unrelated to demand – may be in the offing. Diamond dealers take this to mean that De Beers will likely build in more ability for sightholders to adjust the quantities of rough stones in various quality ranges they want to purchase, and make the complex application process much easier. A number of sightholders have publically proclaimed their dissatisfaction with the system and indicated they may not re-apply for a new term. Since 2009, De Beers has adjusted to the realities of the post-economic crisis market by allowing clients to defer purchases, but has remained relatively inflexible over whether clients could refuse or defer partial lots of certain categories of goods. The sight application process also requires clients to provide extremely detailed analyses of their businesses. Whatever changes may be coming in 2015, the market will have to adjust to a continually challenging environment, especially as far as bank financing is concerned. Last year, ABN Amro, the industry’s leading lender, announced it would limit credit to 70% of rough purchases, a break from past policy when they would finance the full amount. In short, diamond manufacturers and rough dealers must put 30% of their own capital up for each purchase, a move the bank feels will limit the speculative buying that has created an extremely volatile rough market during the past four years. In addition, the manufacturers must invest their own funds into rough that is much less profitable to cut in the current environment. Bank Leumi’s U.S. subsidiary announced this week that it was exiting the U.S. diamond business, a year after it closed out its Israeli diamond industry portfolio. A banker quoted in JCK said the industry’s continued lack of transparency, coupled with the stringent regulatory requirements of Basel III, along with other risks, has increased the banks’ reluctance to finance the diamond industry. Additionally, some bankers claimed that excessive finance created an unsustainable credit bubble that will ultimately cause some large firms to default.